Last August, I wrote about the end of Kepler’s original mission as it had been operating for the past 4 years. Kepler was launched in 2009 with a goal for providing a census for planets around Sun-like stars and helping us understand the frequencies of rocky planets. Kepler stared at the same field monitoring 160,000 stars nearly continuously for those 4 years. To achieve the precision pointing to obtain precise enough measurements to detect rocky terrestrial planets, Kepler had to point with extreme precision with the stars moving very little on the camera. To do this Kepler had three reaction wheels (and one spare) that would help nudge the spacecraft slightly one way or another. Last year, Kepler suffered a second reaction wheel failure that prevents it from continuing with its mission of monitoring the Kepler field. Pointing at the Kepler field, the spacecraft moves too much, and this effectively ended the Kepler mission as is. Kepler had taken its last observations of the Kepler field. 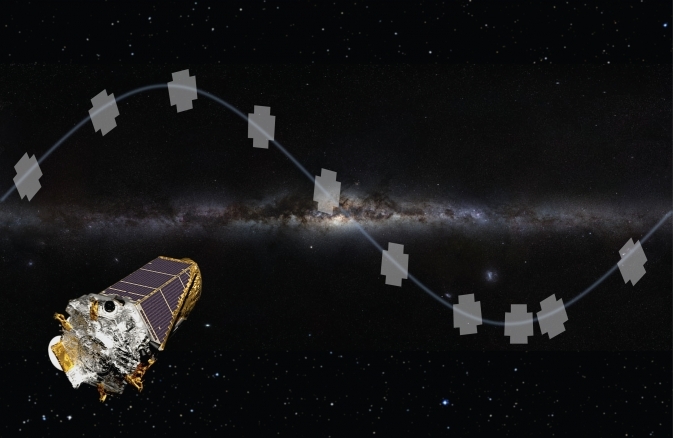 The Kepler team devised a new way of observing with Kepler using solar irradiation to help stabilize the spacecraft and act as the third reaction wheel. They set out to test it and prove this was a viable mission (which they dubbed ‘K2‘) that would return interesting science and discoveries worthy of NASA funding. Back in December, NASA gave the go ahead for K2 to compete with other viable missions in the Senior Review. Well, what is this Senior Review? Space missions cost money. You have to pay for the engineers that keep the spacecraft happy and running, pay the project managers and support staff and scientists, have funds if there are guest observer programs, as well as it costs money to use time on the Deep Space Network to send commands to and receive the data from your favorite telescope. The NASA Senior Review is NASA’s way of prioritizing and deciding which already existing missions will continue on and receive funding from the limited amount of funds available to spend while building and launching new spacecraft. Ben Montet from Astrobites has a nice summary description of the competing missions from this year’s Senior Review. Funding is tight and although these missions and spacecraft have all produced interesting science and capable of continuing to do that, not every mission that was on the chopping block is guaranteed to get money to pay for its operating costs. There simply isn’t enough to go around. Officially today, NASA has announced the results from the Senior Review. You can read the full report from the panel here and the response from NASA. The verdict from the panel for Kepler/K2: “This is an outstanding mission and we look forward to the results from the program. K2 uniquely addresses a range of observational goals and is expected to engage a broad community of scientists.” K2 has been recommended by the review to continue with the extended K2 mission, and NASA has agreed to provide funding. The Kepler team didn’t get all the money they asked for, but 90% of the requested budget more than enough for the K2 mission to officially start science operations in June. K2 is a go! There will be new light curves from never before seen stars coming from Kepler over the next 2 years! Congratulations to everyone involved in the Kepler project who made this happen. They put in lots of tireless effort to find a way to use Kepler in a novel observing scheme and prove that it could deliver interesting science worthy of continuing on. The Senior Review specifically about the science goals and case for K2: “K2 will allow exoplanet surveys of all stellar classes,O-M, giants-dwarfs, and white dwarfs as well as the asteroseismology of late stars, studies of nearby open clusters for the fundamental properties of pre-main sequence (PMS) and zero age main sequence (ZAMS) stars, and explore supernovae and accretion physics in AGNs. These are but a small sample of what can be achieved with the study of precise photometric long term continuous data“ . This is exciting times for the study of extrasolar planets, as Kepler is now primed to deliver a whole new crop of planets and other astrophysical discoveries and results. The Planet Hunters science team and the Zooniverse are working on preparing the site to be able to ingest and serve the K2 data to you all in a fast and efficient way. Stay tuned to this space as we get closer to August when the first science grade K2 data is released. Any information about the currently ongoing Field 0 and its data release? Field 0 data comes out in August. It takes three months to process the data into a form the Kepler team can release to the public and scientific community. I believe Kepler is currently still observing campaign 0 (field 0) . June 1st Campaign 1 (Field 1)would start. Will there be any microlensing opportunities? Yes, Campaign 7 I believe is the microlensing field where its picked for doing ground based and Kepler observations simultaneously to look for microlensing events. With the two chords, I think you get the distance to the lens which is degenerate with other parameters if you only observe from Kepler or the Earth alone. K2 will detect Earth-size planets in the habitable zone of M dwarfs like was the case of Kepler-186f? Likely in the habitable zone. There will only be 75 days worth of observations per field before Kepler has to move on (before the Sun goes into view and sunlight would go down the boresight which would be bad for the mirror and camera or before the solar panels stop being irradiated by the Sun). So with a few transits needed to securely say there is a planet candidate (plus some other checks), that distance range from an M dwarf is outside the habitable zone. Exoplanets that only transit once or twice within the ~75 day baseline are not necessarily off the table; the PH community has proven very adept at spotting these in lieue of computer pipelines. So if the target is bright enough and ground obs can be brought to bear for confirmation of a third transit, conceivably K2 could still deliver a variety of M dwarf candidates at wide orbital separations (or other MS type stars).